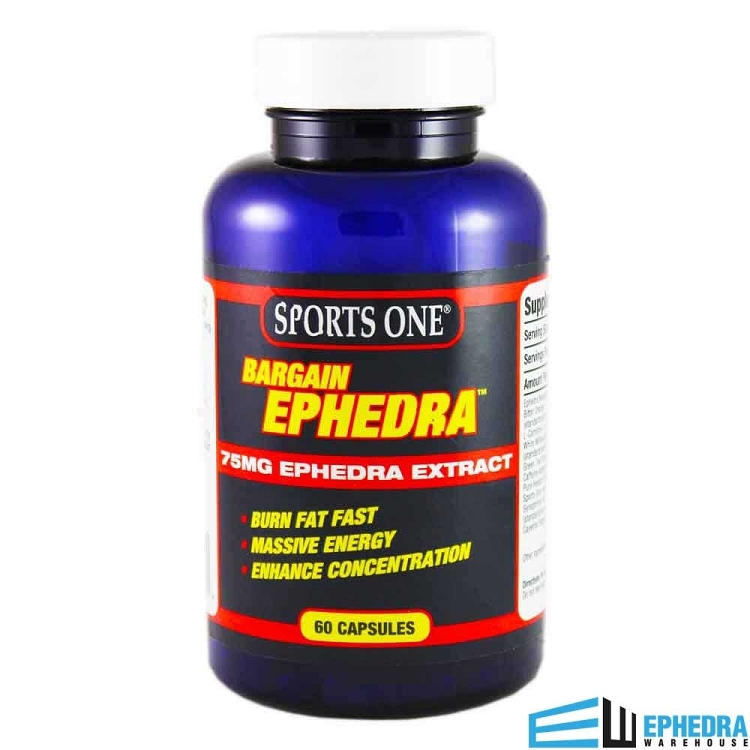 Bargain Ephedra, by Sports One, is one of the most potent ephedra products on the market. It contains 75 mg ephedra extract and a unique combination of stack ingredients for optimum results. Bargain Ephedra may give you a huge energy boost, suppress your appetite, and increase your metabolism. Bargain Ephedra is intended to result in rapid weight loss and better athletic performance. Powerful diet pills have been hard to find in the past. Though you might have wanted to try out a diet pill to help you through the starting point of your diet, it might have seemed like nothing would help, and the pills might have even been detrimental to your goals. Sports One Bargain Ephedra is designed to boost your metabolism, curb your appetite and give you energy. What are Sports One Bargain Ephedra Diet Pills? If you want a diet supplement that offers you legitimate ingredients, Sports One Bargain Ephedra diet pills are for you. As you look down this list, you can already see some of the most powerful performers when it comes to weight loss: ephedra, bitter orange, green tea, and caffeine. Bargain Ephedra has a safe and beneficial blend of ingredients, chosen for their effectiveness and for their ability to work together to assist dieters who have troubles sticking to their plan despite their best intentions. You already know what the main reason for your weight loss is to look good. When you use Sports One Bargain Ephedra diet pills, you may begin to look better, but you may also feel better. When your body doesn't have to carry around a lot of extra weight, it will be able to move around with ease and you will be healthier. Think about how it would feel to carry around a bowling ball all the time.Now, imagine what it would feel like to let that bowling ball go. That's what you go through when you lose weight. Maybe you just want to play with your kids without stopping every few minutes to catch your breath - just like you've always wanted to do. It doesn't hurt to look at Sports One Bargain Ephedra diet pill reviews to see what others are saying. With the help of Sports One Bargain Ephedra diet pills, today could be the last day you weigh what you weighed this morning. Imagine being able to finally remove that extra weight. And now you have help that doesn't stop until you've hit your goal. Try Bargain Ephedra today. Very disappointed...no energy and did not supress my appetite. No weight loss. Was waiting and hoping for the energy to come..but never did. Also, didn't notice a difference in my appetite level, was still hungry! Very dissatisfied. I was hesitant to try Bargain Ephedra at first but am so glad I did. It has given me energy and helped me control my food cravings. I love it. not a bad energy supplement but be aware....the ephedra extract that is in this stuff contains little to no EPHEDRINE content. that energy buzz that you used to get from the old mini thins and yellow jackets isn't there. would I buy it again? no. will I take what I have? definitely. Great Product. I miss taking the original ephedra products but this is very good. I will keep buying sports one as long as they produce it. I was feeling really sluggish in my workouts needed a boost and tried this and it was just what I needed to get over the slump. Actually very clean and didn't leave me feeling jittery or buzzed but I had the energy I needed which was great. 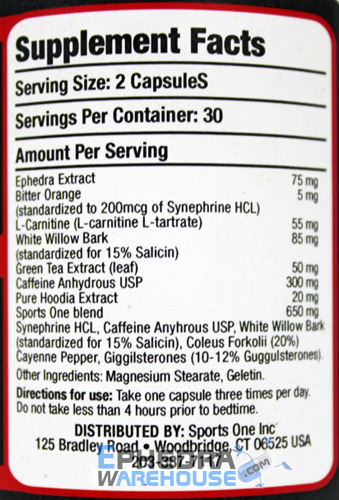 Bargain Ephedra with 75 mg Ephedra, offers a nice steady amount of energy all day long. Just the right kick, long lasting energy without crazy jitters, and immediate fat loss results!!!! For the price, it is a decent product. I had used Black Mamba prior to buying this and I do like Black Mamba better.I found the energy to last about 6 hrs. with one capsule. Bargain Ephedra gives me great energy and I can workout longer and harder without getting exhausted. I just started taking this and can't wait to see how it effects my metabolism. I have lost 2 pounds this week but I expect I will continue to loose a lot more! This diet pill works great. 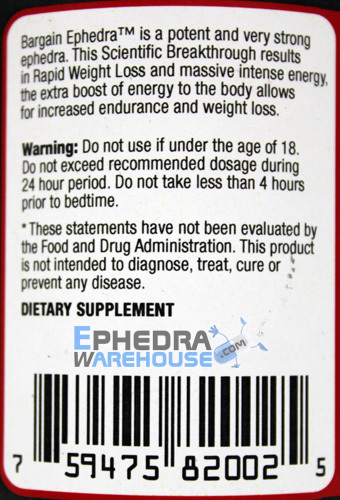 I have had better ephedra dietary supplements ,but this exaclty as the names states great bargain ephedra. Tried Bargain Ephedra and Whacked Out. You pay for what you get.